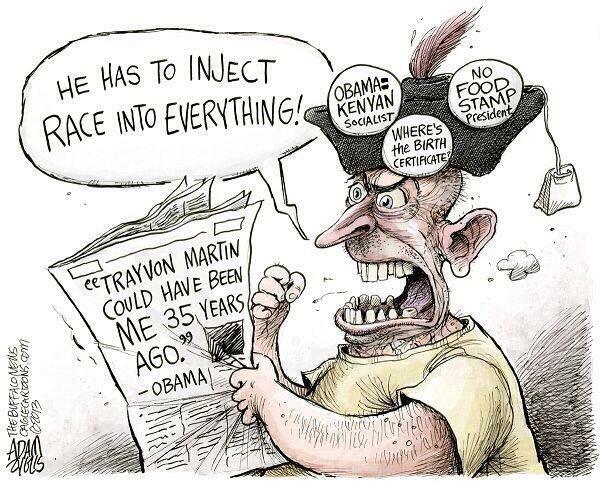 President Obama made a few “impromptu remarks” a week or so ago following the controversial verdict that saw black teenager Trayvon Martin‘s caucasian killer acquitted in Florida. As you can hear on the video, his comments were considered, reflective and looked to placate those that are angry whilst also offering the prospect of continuing to work to overcome the racism that, whilst clearly on the decline, remains widespread in the US. On closer examination, it has tended to be those that are quick to abandon intelligent discussion that use the PTRC line as a fig leaf to cover their own racist inclinations. On Twitter, it is nearly impossible to avoid Tea Party and UKIP supporters who appear to spend their time trawling through social networks in search of anyone with the temerity to suggest that immigration might be beneficial for the host country (in fact most independent studies show this to be the case). Once identified they approach, often with an initial politely worded communication, in order to critique the basis for the aforementioned positive comment. If their target is foolhardy enough to take their bait they will immediately ‘share’ the latest hysterical ‘fact’ that has been reported in The Daily Mail or some other opinion sheet or personal blog (and is usually incorrect or an especially partial interpretation of, invariably, someone else’s research). ..as if this meaningless phrase somehow both answers the accusation of racism and simultaneously absolves them of responsibility for their words and deeds. The next time you find yourself in one of those irritating and unrequested social network ‘debates’ about immigration or the Tea Party or UKIP and the PTRC line is thrown at you, remember that it is a sure sign that your interlocutor has something to hide and remind him or her that, ironically, it is they who are playing the race card. Or better still save yourself the grief, block them and carry on with your life! Wait: What? How Could You Possibly..You’ve Got to be kid… There is no way… I can’t.. Oh my God. It’s not just UKIP members who are fruit loops, it’s their donors too!